This juried exhibition in Markeim’s main gallery will bloom with a kaleidoscope of art inspired by nature. Artists are encouraged to submit new and challenging perspectives of flora, flowers, buds, grasses and blooms interpreted in all media. The juror for the show will be Carol Gooberman. Carol has been a professional artist for over 40 years. She earned her BFA degree from Moore College of Art and Design in Philadelphia in 1977, and now lives in Haddonfield, NJ. 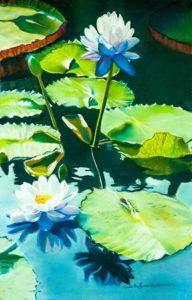 Carol’s work has been seen in homes and galleries throughout the region. Her work has been described as “soft realism”, as she renders light using pastel colors to create colorful shadows and reflections. Carol paints flowers and nature, Victorian themes with women and children, beach scenes, cats, sunsets, etc. The digital submission deadline has passed. Please submit your entries in person according to the directions in the prospectus. Thank you.